Distributor and stockist for Australia. $60 million inventory, shipping Worldwide. Supplier of Bonney Forge Gate, Globe & Check Valves in stock. Carbon Steel, Stainless steel, Low temperature carbon steel, Duplex, Special alloys. A105, A105N, 316, 316L, 304, 304L, F51, F55, F22, F11, F5 in ANSI class 150, 300, 600, 900, 1500, 1690, 2500, 2690. 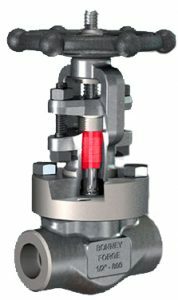 Wedge gate valve, swing check valve, piston check valve, stop check (SDNR) valve, parallel slide gate valve, globe valves in socketweld, BSP, NPT, flanged RF and RTJ, buttweld. Click here for API602 catalogue. Click here to view Bonney Forge stock list. Click here for details on website. Global Supply Line is proud to be a Bonney Forge agent and supplier for Australia & New Zealand. Shipping Worldwide.